Red envelopes/packets are money wrapped in red paper given to kids from their parents, grandparents and others as New Year gifts. They are called hongbao in Mandarin and lai see in Cantonese. Sending red packets is a well-observed custom at Chinese New Year. Chinese people love the color red, and regard red as the symbol of energy, happiness and good luck. Sending red packets is a channel for sending good wishes and luck. Actually, the significance of red packets is the red paper, not the money inside. Wrapping money in red packets is hoped to bring more happiness and blessing to the receivers. Hence, it is impolite to open a red packet in front of the person who gives you. In China, the red packet is called yasui qian (压岁钱 /yaa-sway chyen/), which means ‘suppressing ghosts money‘. Those who receive a red packet are wished another year negotiated safely and peacefully. Those who intend to send red packets prepare them in advance, such as after the New Year’s Feast, as when the bell of a New Year is ringing, kids begin to pay New Year visits to greet their elders, and then it is customary for the elders to give the kids their red packets immediately. Hongbao can be put under kids’ pillows by their parents if they fall asleep on the New Year’s Eve. Who should I give a red packet to? And how much should I put in it? Traditionally speaking, if you have started earning money, it is time to start your experience of giving red packets. Giving a red packet is a way to share your blessings. Generally the amount of money wrapped in the red packets depends on your income. However, there is a custom that if you are not married, you need not to send red packets to others. Your close relatives (like your parents and your grandparents) would keep giving you red packets even though you are married, which is a symbolism of their love and blessings to you. To other children: Prepare some small red packets with $5 or $10 for acquaintances’ children, in case you meet them during the Chinese New Year period. However, they are only guidelines. The true meaning shall always be a way “to share your blessing”. 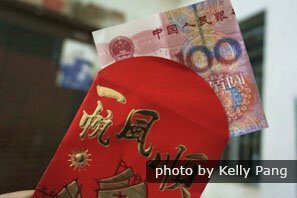 Previous Post10 Interesting Facts about Chinese New YearNext PostHave You Said These 6 Things About Your Credit Card Recently?